A strange series of fires is raging in Seattle - white-hot fires that burn so cleanly even the ash is consumed, along with all traces of the fires' victims. Brilliant forensic investigator Police Sergeant Lou Boldt is back, battling the mysterious arsonist. He is also keeping his eye on the Fire Warden, who seems to be a little too close to the heat. But police psychologist Daphne Matthews is more concerned about the victims of the blazes, especially the smart and wily ten-year-old boy who had a terrifying encounter with a disfigured, badly burned man. 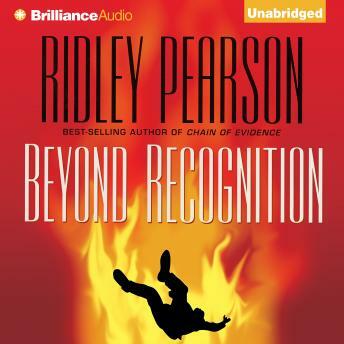 Beyond Recognition is the story of a deadly, taunting game of cat and mouse, where the stakes are raised to a burning point that might spell disaster for Boldt - and the city of Seattle.